Janelle Monae attended the 61st Annual Grammy Awards at The Staples Center in Los Angeles wearing Jean Paul Gaultier SS19 Couture Dress (Not available online), Steve David Headpiece (Not available online), a 18k HardWear Link Earring ($4,200.00 – pair), 18k HardWear Graduated Link Earrings ($5,200.00 – pair), a HardWear Ball Ring ($1,200.00), a HardWear Small Ball Ring ($850.00), a T Two Ring ($1,600.00), T Two Ring with Diamonds ($2,950.00), a T Two Narrow Ring with Diamonds ($2,550.00) and T Two Narrow Ring Pave ($4,200.00) all by Tiffany & Co, and LeSilla Velvet Pointed Pumps (Sold Out). Ariana Grande attended the Billboard Women in Music Awards in New York City wearing a customized Christian Siriano Pre-Fall 2019 Dress (Not available online), Yvan Tufenkjian Stacked Diamond Choker (Not available online), the Embrace Diamond Band Ring ($7,375.00 – similar style) and The Tiffany Setting Diamond Ring ($12,400.00) both by Tiffany & Co., Le Vian Diamond Stud Earrings (Not available online) and Le Silla Eva Stretch Boots ($669.60). Maia Mitchell attended the ALMA Awards in Los Angeles wearing The 2nd Skin Co. Soul Long Dress with Draping (€1,170.00), Amethyst and Diamonds Earrings (Not available online) and Amethyst Cabochon and Diamond Halo Ring ($5,600.00) both by Ricardo Basta, and LeSilla Gwen Patent Sandals ($638.00). 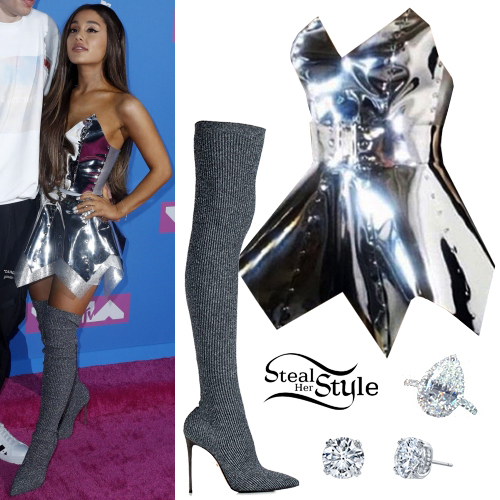 Ariana Grande arrived at the MTV Video Music Awards at Radio City Music Hall wearing Venus Prototype The Chrome Plated Rubber Bustier & Mini Skirt ($1,500.00), her custom-made Engagment Ring by Greg Yuna ($93,000.00), Harry Kotlar Diamond Stud Earrings (Price upon request) and Le Silla Naomi Boots (Not available online). Chantel Jeffries was spotted the ‘Live with Kelly and Ryan’ studio in New York City wearing a Moschino Fall 2018 RTW Dress (Not available yet), Jennifer Zeuner Sade XLG Hoops ($220.00) and Le Silla Eva Stretch Boots ($1,116.00). You can find similar boots for less at Simmi ($49.00). 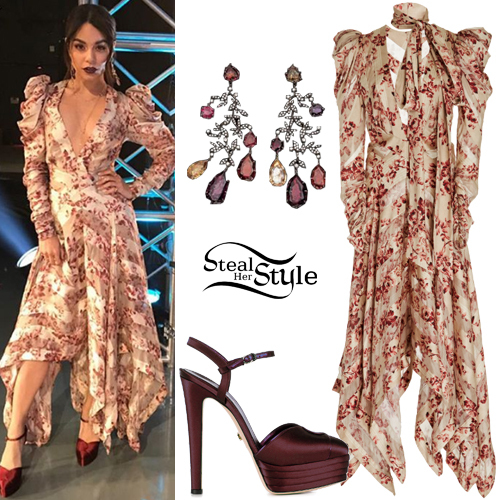 Vanessa Hudgens appeared on So You Think You Can Dance last week wearing a Zimmermann Unbridled Chevron Silk Dress ($2,650.00), H Stern Earrings (Not available online), and Le Silla Miranda Satin Shoes (Sold Out). Ariana Grande performed on The Tonight Show Starring Jimmy Fallon wearing a Beverly Stripe Fil Coupé Peplum Satin Top ($1,220.00 – wrong color) and Nivi Stripe Fil Coupé Satin Shorts ($535.00) both by Cecilie Bahnsen, Harry Kotlar Classico Diamond Earrings ($71,600.00) and Le Silla Over-The-Knee Stiletto Boots (Sold Out). 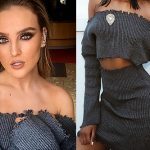 You can find similar boots for less at Missguided ($17.00) and ASOS ($79.00). Ariana Grande debuted the music video for her new song “No Tears Left To Cry” on Thursday. In one shot Ariana is seen wearing a Rasario Jacquard Dress With Voluminous Skirt ($2,295.00), Harry Kotlar Arabesque Diamond Stud Earrings ($13,675.00 – similar style) and Le Silla Over-The-Knee Boots ($505.30 – available in velvet). 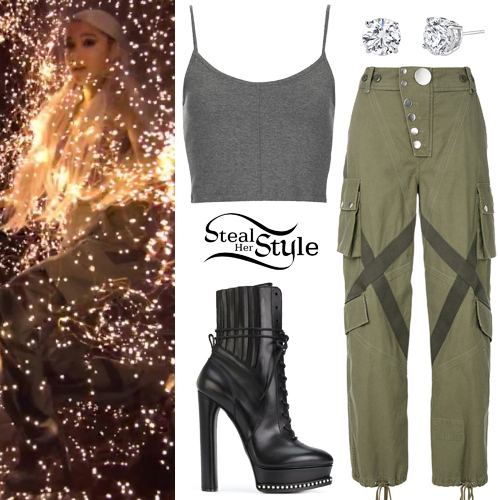 In another shot Ariana is seen wearing a Topshop Petite Strappy Seam Bralet (Sold Out), Alexander Wang High-Waisted Multi-Pockets Trousers ($748.00), Harry Kotlar Classico Diamond Stud Earrings ($39,760.00) and Casadei City Rock Platform Ankle Boots (Sold Out). In the next shot Ariana wore a custom-made Ashton Michael Silk Charmeuse Dress (Not available online), Harry Kotlar Arabesque Diamond Stud Earrings ($13,675.00 – similar style) and Stuart Weitzman Nudist Platform Sandals ($425.00). You can get the look with a Boohoo Lily Luxe Satin Mini Dress ($23.00 – pictured). In this shot Ariana is seen wearing the UO Out From Under Adelina Fusion Triangle Bra ($16.00 – wrong color), Boohoo Emilie Basic Halter Neck Bodysuit ($5.00), Harry Kotlar Classico Diamond Stud Earrings ($39,760.00) and Free People Capsule Cable Over-the-Knee Sock (Sold Out). Zendaya Coleman unveils the Bloomingdale’s Holiday Windows on 59th Street wearing a Peacock Printed Dress ($2,890.00) and a Mohair-Blend Coat ($2,890.00) both by Miu Miu, and LeSilla Eva Suede Boots ($669.60). You can find similar boots for less at UrbanOG ($36.00+).